If you thought dealing with flesh-eating zombies was a headache, try taking care of a child while dealing with flesh-eating zombies. For some reason, kids find the easiest ways to get lost, shot or just plain in danger. And don't ask Rick to be the babysitter, either. "Bloodletting" felt like the missing end of the season premiere, practically picking up right where it left off and sending Rick and the wounded Carl towards Hershel's farm. I love the new setting and the peaceful appearance, as it illustrates a nice contrast with the claustrophobia of the city. Just looking at the painting-like locale makes it hard to believe that zombies have taken over the world. Fans of the graphic novel should be pleased with the introduction of this significant location, especially with the new character at the center: Hershel. He already fits right in with the original characters and Scott Wilson brings out a sense of versatility to the role. He's straightforward and honest, perhaps a little stern, but certainly caring. He even exerts a sense of leadership without acting overbearing or aggressive. Hershel may be helpful now, but how long will that last? Who gets to play leader once the two groups finally come together and Carl is (hopefully) fixed? Even as Rick and Hershel seem to be on the same page of helping Carl, the seeds of disagreement were planted when the two discussed their thoughts on the "epidemic." Hershel's religious views make him hopeful and optimistic for a cure, while Rick seems less certain that things will change for the better. Will Hershel turn into a fanatic? He seems like he could be the perfect grandfather, but some things may prove too good to be true. I'm pleased the show continues to follow the guideline that is the graphic novel, but I am also open minded about the changes and alternative routes the TV series decides to take. For one, I'm still enjoying Daryl and his smart alec comments. Sure, he seems a bit like Sawyer from Lost (even the group traipsing around the woods reminded me of Lost), but he brings an edgy character that both Rick and Shane couldn't fill. You can't have everyone quiet and sullen. There need to be scenes like shooting the zombie in the head and telling it to "shut up." Plus, Daryl isn't just a one-dimensional racist redneck. He's rational in questioning Maggie when she shows up. He remains positive in finding Sophia. He even holds a large stash of drugs which he gives up to T-Dog. It's good to have someone who remains as sane as can be in the situation. Unfortunately, T-Dog seems to be anything but sane. Has he gone off the deep end because of his fever or is that just his personality? I'm finding his character hard to like or even connect with, and it doesn't help that his name is T-Dog. I just want to laugh every time the characters have to say his name with a serious face. I guess not every change from the source material works out for the best. One thing I definitely noticed was the contrast in Lori's reactions to Rick and Carl getting shot. When she first heard the news in a flashback that connected this season with the first, she just seemed blank faced. No crying out. No tears of loss. Only Carl showed the obvious emotion to a loved one getting hurt. Had Lori really lost the love back then? When it came to learning of Carl's injury, she was wracked with pain and emotion as she clung to Rick. I believed her when she went to her son's side. Lori truly cared. I know that there's still a sense of strain on Rick and Lori's relationship, but has this zombie apocalypse brought them back together? Is it simply circumstance? Even though I wanted Rick to rush to help Shane, I was glad he finally chose to stay with his son and Lori. Quit leaving them, Rick, even if they can be a handful! 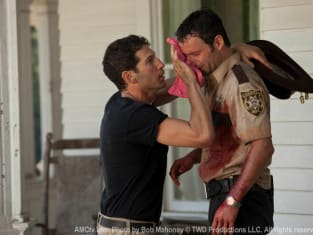 Speaking of Shane and Rick, did anyone get the feeling that there was a little too much bromance bonding going on? I know Rick needed someone with stability to help calm him, but holding each other's faces close had me thinking they might just start making out. I think their relationship needs to move a little slower. At least Shane was willing to make the sacrifice to get the supplies for Carl. He's definitely trying to make up for all of his indecent acts last season. It was a great moment when Otis explained where they needed to go and he was like, "really?" as he saw the swarm of zombies. Nothing is ever easy in life. Additionally, it was a great way to cliffhang the episode with a mere pin holding back the snarling, starving zombies. They are just so scary good. But since when could the zombies run? Was that simply camera work making them appear faster as they chased Shane and Otis? I thought they walked, or stumbled, even dragged along quickly. But they seemed to be booking it. The reason I liked that they walked instead of 28 Days Later-sprinted was that it made them not as hard to handle one on one. The true danger of a ton of them together was because they could surround you, not because they were fast. Are they still actually the walking dead? The episode continued its gradual pace, although at times felt a bit slower than I would have liked. That said, the progress and situations didn't feel rushed and I'm pleased that we are just starting the journey that is Hershel's farm. And, of course, it's hard not to have a guilty pleasure for the zombie goodness that makes this series fun and filled with entertainment. Are there any dark secrets hidden behind this seemingly serene setting? Will Shane and Otis survive? Will Carl? Can I handle waiting a week for the next episode? Sound off below with your thoughts on the second episode.